– which comes to 36. As the name suggests, you can visualise triangular numbers as a triangle of points. Everyone in a group of people shakes hands with everyone else. The total number of handshakes will always be a triangular number. For instance, five people will make ten handshakes. – so the 100th triangular number is 5050. The first four triangular numbers. How many do you have to add each time? 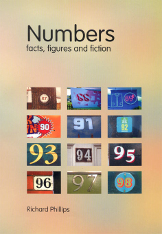 Based on the book Numbers: Facts, Figures & Fiction.